Dave Carter was relieved to see depleted Moneyfields come through their FA Cup preliminary round tie with a 3-1 win against Andover New Street at Dover Road. 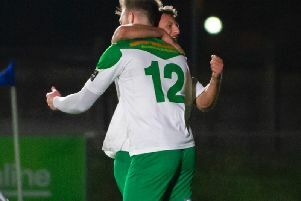 Goals from Joe Briggs, Lloyd Rowlatt and George Root ensured the hosts eventually overcame the threat of the Wessex League visitors. ‘We didn't play particularly well while our opponents kept going and going,’ said Carter. ‘It didn’t help we lost both our central defenders in the opening 20 minutes. ‘At times our players were dropping like flies and we had to keep changing things around. Briggs gave Moneys the lead on 18 minutes against the run of play. He made a good run into the area – past three defenders – before slotting home. The hosts lost Curtis Da Costa injured and took Dan Woodward off because he was in danger of collecting a second yellow card. Ten minutes before the break Rowlatt added a second goal when he finished off a good move at the near post. A dreadful mix-up between keeper Steve Mowthorpe and Sam Pearce gifted New Street a goal two minutes into the second half. However, they never really threatened again and seventeen-year-old Root sealed the win in stoppage-time. Carter will hand a debut to new striker Felipe Barcelos in Moneys’ Southern League division one south derby against Winchester City at Dover Road today (3pm). Barcelos signed from Didcot Town during the week. Dan Wooden will also play his first game after returning to the club from AFC Portchester. ‘We will have to play a lot better if we want to beat Winchester,' added Carter. Lewis Fennemore and Brett Poate are still unavailable.